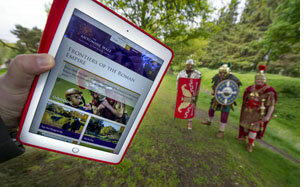 EDINBURGH, 2015-6-3 — /Travel PR News/ — Featuring an interactive map, downloadable walking and cycling guides, and in-depth information on the archaeology and history of the wall, the new site will give visitors all the information they need to explore the wonders of the most northerly section of the Frontiers of the Roman Empire World Heritage Site. It provides information on both sites and museums, and key things to see and do for families and tourists planning a day out along the Wall. In addition to visitor information, the website contains specially developed educational and research resources for all ages, including a database of archaeological artefacts discovered along the wall. “This website is a fantastic resource for visitors and educators alike. With summer fast approaching, there has never been a better time to get out and explore the wall and we’ve included lots of resources to help with that, from suggested cycling routes to an events page. 2015 is the Year of Food and Drink, a celebration of Scotland’s natural larder and the role that food and drink plays in shaping our economic success. Scotland generates over £2.5m per day through food and drink tourism. A series of themed months will create an appetite for key areas of Scotland’s food and drink industries – from seafood and whisky to berries and high-quality meat. To find out more visitwww.visitscotland.com/tastescotland. This entry was posted in Attractions, Tourism, Travel, Travel Management, Travel Marketing, Travelers and tagged Antonine Wall, Historic Scotland, Patricia Weeks. Bookmark the permalink.